The animation in a few sequences left me feeling like some of the potential impact was squandered. Ghost in the Shell Arise: Ghost Pain is the first of four episodes in the re-imagining of the classic cyberpunk sci-fi anime series. It’s set in 2027 and is a prequel to the original series. It starts off with Daisuke Akamari, the chief of Public Security Section 9, overseeing the body of Lieutenant Colonel Mamuro being exhumed. Mamuro was killed in what was reported as a random robbery and instead of his cyborg brain being turned over to Public Security Section 9 as requested, it was buried along with the rest of his body. And since his murder, evidence has come to light suggesting he was corrupt and involved in illegal arms deals. And with this scandal close to becoming public, Chief Akamari wants to get to the bottom of Mamuro’s murder because he doesn’t believe the Lt. Colonel was the type of person who would be involved in such a scandal. Suddenly the exhumation is interrupted by another person who doesn’t believe the Lt. 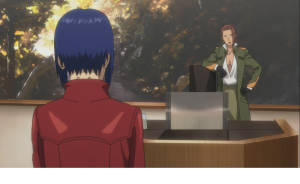 Colonel was corrupt and that’s Major Kusanagi, who is currently part of the 501 Organization, and Mamuro was her superior officer. After the Chief convinces Kusanagi that they’re both on the same side, they’re both surprised that there’s a killer cyborg in the coffin where the Lt. Colonel’s body should be. 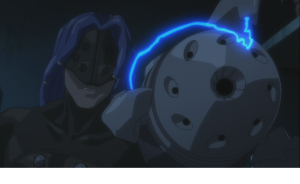 Kusanagi is able to defeat the cyborg and protect the Chief before it explodes. Now the mystery of the Lt. Colonel’s murder deepens. How did a killer cyborg get in an undisturbed grave, who wanted the Lt. Colonel dead and what is the connection to Kusanagi just getting back in town? This conspiracy puts the Chief and the Kusanagi’s lives in danger and they will need more help in getting to the bottom of it. I’ve always enjoyed the Ghost in the Shell series. The futuristic sci-fi world that dealt with its subject matter in a very mature way, while posing questions in classic cyberpunk fashion gave viewers more than enough to enjoy. So when I heard there would be a re-imagining of the series starting with 4 OVAs referred to as Borders, I was both excited and slightly skeptical. Excited because there would be more Ghost in the Shell as well as a great starting point for a new series, however I was slightly skeptical because I didn’t want what made the series great to be watered down. So I was feeling really good after the opening sequences because it had enough intrigue from Kusunagi’s actions at the airport to the killer cyborg in the coffin, the character portrayals were spot on as well as the voice acting, and the action was intense. And even though prequels usually have that overwhelming sense of inevitability, there was enough to this story where it was more than just waiting to get to a point where the Major would join Public Security Section 9. (As a matter of fact, all 4 OVAs are standalone stories so even though there’s progress there are no cliffhangers from one episode to the next.) The new characters introduced play a significant role in that. There’s Kurtz (Kurutsu), the head of the Army 501 Organization, who gives Kusunagi permission to investigate who tried to kill her and booby-trapped the coffin. Kurtz wants the Major to succeed because if Mamuro is found guilty of being corrupt that would impact her and the Major because all of his recommendations would be voided. But at the same time she has her motives because she doesn’t want Kusunagi to make any missteps that could result in the unit being disbanded. And there’s Raizo, a combat cyborg in the same unit who for some reason doesn’t want the Major to get too far in the investigation and has no problem with trying to stop her physically at times. Yes there are familiar faces such as Batou, who is initially hunting the Major, and Togusa, who is a detective trying to solve a series of prostitute murders that are somehow connected to the case. There are some slight differences regarding when Togusa is introduced from the original series but the way they come together for this particular episode works great. It felt like a natural progression of the story. Even the way Major and Chief Akamari started working together was a great storytelling mechanic as well as highlighting the new origins. Kusunagi was a full cyborg from birth so she never had a real body and her cyborg body belongs to the Army. So the most the Chief could do initially is offer to hire her as a consultant since she’s an expert on solving cyber crimes. I won’t give away the story but the pacing is excellent as it allows for enough of the story to unfold without feeling rushed and enough action sequences to keep it intense. You have to feel a rush of excitement watching the Major and Batou meet for the first time and the fight that ensues. Even if you’re completely unfamiliar with the characters you’ll still enjoy the sequence. 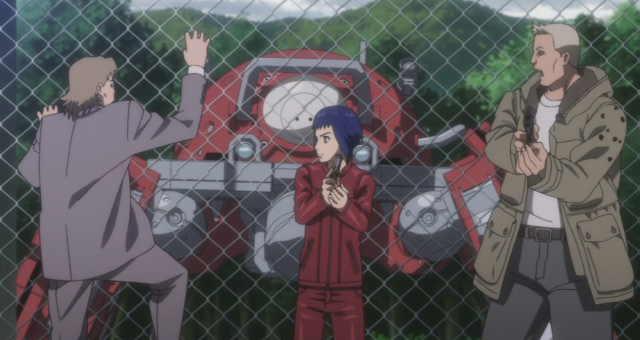 And that’s one of the things this episode does so well, it’s very enjoyable even if this is your first time watching Ghost in the Shell but it’s also satisfying for fans of the original series. Overall the animation was solid although there were a couple of scenes where some of the potential impact of a later fighting scene was squandered due to the animation feeling slow. The story itself was very solid and the questions it posed about reality were interesting and the personal touch and portrayal of the backstory of the Major was exceptionally well. Ghost in the Shell Arise: Ghost Pain was a very entertaining episode and an amazing start to the re-imagining of the Ghost in the Shell series. The character portrayals are true for the most part in comparison to the original series but enough changes to feel fresh and open the door to even more story lines. The story was solid and the action sequences were overall intense with just minor suffering from the animation. If you’re a fan of the Ghost in the Shell series you will love this first episode and the potential of what’s to come. If you’re completely unfamiliar with the series or always wanted to get into it but never got around to it then this is definitely a great starting point and you shouldn’t miss it. Major Kusunagi says she found her reality, well I found a series I know I will definitely love.